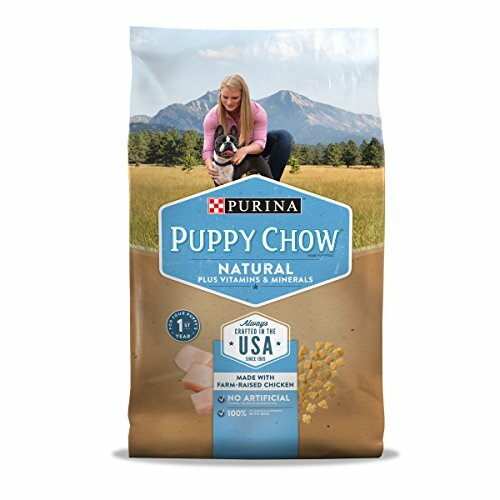 Is Purina good for my puppy? Welcome to our review of Purina puppy food and dog food! 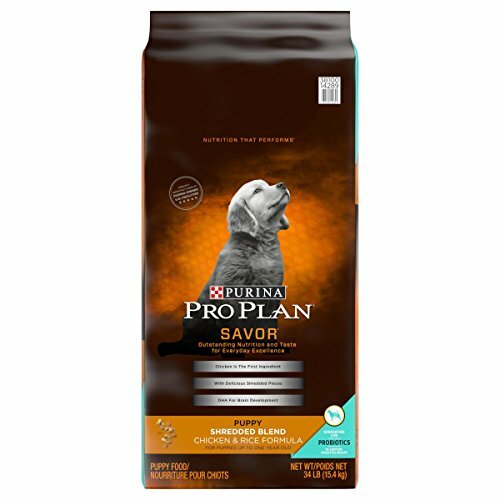 Most of you will be familiar with the brand, given that Nestlé-Purina are the second-largest maker of pet foods worldwide. If you’re already feeding your little puppy with Purina, you’ll know that it’s both economical and reputable in terms of safety and nutrition. But what are the benefits of the different products? What’s Purina One? How about Beyond? Is there a Purina grain free dog food? Let’s take a look together and find out! What’s special and unique about Purina? Why the Purina dog food reviews and Purina puppy food reviews? What is a hydrolyzed dog food, exactly? My puppy won’t stop begging for human food! What do I do? Purina wasn’t always Nestlé-Purina. In fact, the company’s history dates all the way back to 1894, when three Americans surnamed Danforth, Robinson, and Andrews started up a farm animal-feeding business in St Louis. They were renamed Ralston Purina a few years later and opened their first center for pet care and nutrition in 1926 in Missouri. If we fast-forward a little more to around 1963, Purina started making their signature Puppy Chow with the red-and-white checkerboard trademark that we all now know so well. Since then, they’ve published research related to pet care, branched out into specialized lines for doggy and cat treats, and gone nation-wide with their charity initiatives. 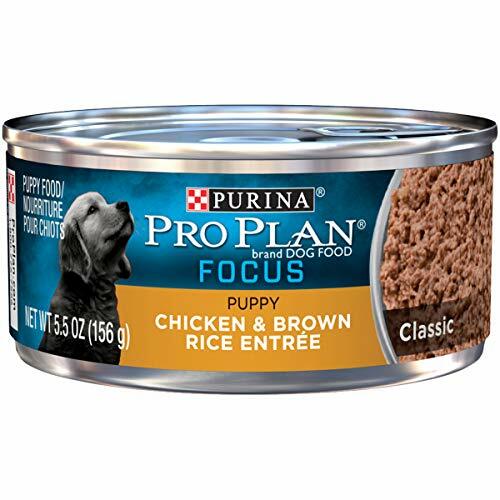 As a result, there are so, so many lines of different Purina puppy and dog foods, from Pro Plan, through Puppy Chow and Purina One, to Beneful and Beyond. 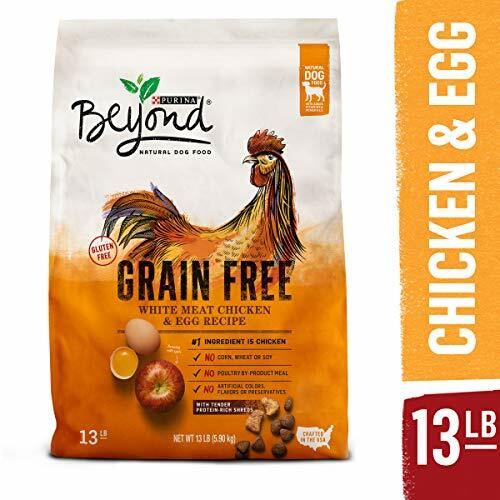 We are just LOVING the new Beyond range that Purina have released. The entire range is made with ingredients that can be tracked all the way back to their original source. Recipes are crafted with input from a nutritionist, and none of their kibble production is outsourced to other companies- it’s all made in the U.S., too. 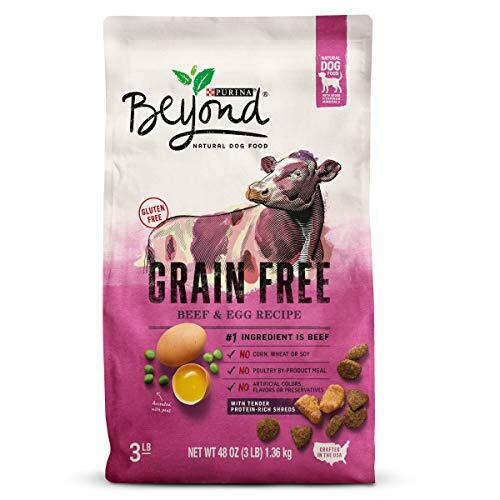 The Beyond line includes the gluten-free formulas we’ve included in our Purina Grain Free Dog Food Review and bonus Purina Beyond Dog Food Review- they’re both made with real and natural meat as the top ingredient and include veggies for vitamins. We’re also liking the fact that Purina make just so many different kinds of food for our puppy friends. Some are made without any by-products, and most feature zero synthetic flavoring, coloring, or preserving agents. Some lines, such as the Pro Plan dog foods include specialized formulas for giant-, large-, and small-sized dogs and puppies. The Purina One line, on the other hand, always puts real meat at the top of the ingredients list, and contains no ‘filling’ agents at all. Well, there are so many different Purina dog foods and puppy foods that we just had to take a look! The brand is exceptionally popular, economical, makes super-healthy options, and even have heartbreakingly sweet and helpful blogs all about puppies. Make a delicious-looking line of treats. What do you think? Let’s take a look at what Purina product might best suit your fluffy best friend! 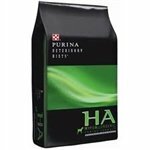 You’ll find absolutely no grains in this excellent Purina Beyond formula for grown dogs. So, it’s entirely without gluten and very much suitable for all those dogs who might need to be on a gluten-free meal plan. Tuna’s probably going to be a welcome change of protein for dinner for your dog, and egg, too! Glucosamine, and zinc, for joints and skin, respectively. No artificial add-ins for coloring, flavoring, or preserving this food- and zero strange by-products from poultry. Peas are the only green veggie in here, but that’s still great, we reckon! The lack of by-product and artificial add-ins is what we love best about this, and the fact that it can be flexibly fed to all your adult dogs- large and small- to provide a holistic diet. Multiple protein sources are hard to argue with, too, unless you’ve got a dog with certain allergies. This one’s technically a Purina One puppy food review because Purina One’s quite popular with you puppy lovers! Not for no good reason either, ‘cause there are zero icky fillers in this chicken dinner. Kibble that crunches when your puppy munches- for clean teeth and less tartar! 28% protein, along with 17% fat are two healthy figures for your growing fluffy friend! Not suitable for puppies on a grain- or gluten-free diet, as it’s made with corn and milled soybeans. 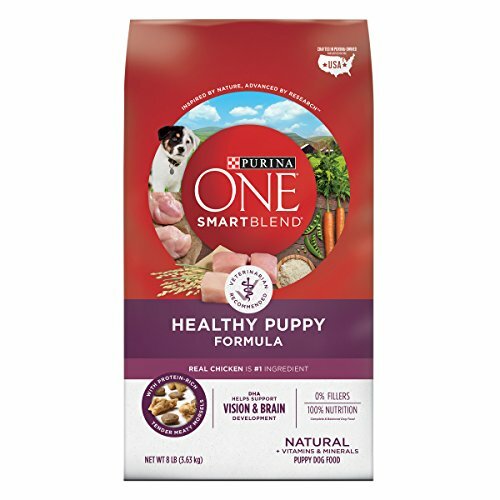 Some of the ingredients here aren’t exactly optimal, but as a complete recipe that’s also balanced, Purina One is pretty much all-around healthy. It’s got those essential nutrients and supplements for bouncy and happy puppies, too, like DHA and glucosamine. This formula’s AAFCO-approved for all stages of doggy life, and is pretty high in protein, which is what puppies need to become big (or just bigger, if you’ve got a small-breed!) and strong. No artificial agents for preserving, flavoring, or coloring in this food! Top, leading ingredients in this chow are corn products and by-products from chicken. This is the Natural version of Purina Puppy Chow, which skips out on the synthetic add-ins like flavors. It’s got plenty of vitamin supplements and minerals, as well as beef and chicken. Here’s a Pro Plan chicken dinner for your young puppy companion that’s based on chicken, rich in minerals and contains healthy fatty acids. Minerals in here include manganese, copper, iron, zinc, and potassium. There are milled by-products from poultry in this formula, too. There are no veggies, and both by-products and grains can be found in this recipe. However, if you’re looking at the mineral, vitamin, protein, and fat percentages, everything’s there for development, energy, and growth. It’s also got those Omega acids that are important for shiny coats! Real chicken’s the number one ingredient in this soft dinner for growing pups, and there’s also salmon in here. 7% fat is just spot on for a wet puppy food. Contains some ‘meat’ by-product, which is an ambiguous ingredient. Wet puppy chow’s pretty much always super as a ‘topper’ for kibble, and an interesting way to make sure that your little one gets sufficient moisture in his daily diet. This recipe’s pretty neat as a first solid food, too, as you can mix it with water for that initial foray into real puppy food! Purina Beyond is quickly getting super-popular with puppy and dog owners who care about their pets’ health. This formula’s got at least 4 protein sources that we counted, with chicken playing the starring role. Apples, peas, and supplements to give your adult dog Vitamins E, A, K, D, B and C. Not the whole alphabet, but pretty good, right? No milled by-products, and no grains at all. There’s egg in this one, but it’s clearly stated on the label, so no confusion here. We really like Purina Beyond because it has no wheat, and is free of gluten. The fat’s naturally preserved, and there are zero synthetic agents for coloring or flavor. Just good, hearty nutrition. Suitable for all ages, this formula’s designed to reduce the risk of allergic reactions through the use of soy protein that’s been hydrolyzed. Technically, it’s a vegetarian dog food. Pretty unique, no? It’s developed to be appropriate for dogs and puppies of all ages who are susceptible to tummy upsets, or at risk of pancreatitis. Corn starch is this food’s first ingredient- not real meat. Soy’s the main protein source for this veggie dog food, and this helps puppies and dogs with allergies to develop the lean muscle they need without having to eat any of the meats they may be allergic to. Soy’s considered a ‘novel’ source of protein in dog foods, meaning pups and adults alike are less likely to have been exposed to it and developed allergies over time. Allergic reactions tend to take place within your pup’s body when his immune system recognizes some molecule as potentially harmful. When this happens, you might notice such symptoms as sneezing, itchiness or runny, watery eyes. It’s best to take your puppy to the vet if you notice anything like this, as they may find it necessary to put him onto a hypoallergenic food, or something with hydrolyzed protein. The protein molecules in hydrolyzed protein puppy foods and dog foods have been broken into much smaller pieces if they haven’t been broken entirely into their constituent amino acids. In this smaller form, they are less likely to be triggers for an allergic reaction. The HA dog food we’ve recommended in our Hypoallergenic Purina Dog Food Review is soy-based, so if you’ve got a puppy who cannot handle any of the more popular meats that are so common in puppy foods, this could be a great option. It can be so funny at first, and maybe even cute when your puppy shows an interest in your human dinner. But after a while, yes, it might make you wonder whether something’s the matter with his puppy food! If your puppy is begging for food at the dinner table, it’s not necessarily because something’s wrong with his own kibble, and there are some simple steps you might want to try before you start stressing out. Puppies can quite easily be trained using positive reinforcement, so if they’re begging at the dinner table each night and you give them a little nibble of food to keep them quiet, they’ll probably think something like “Hey…that worked!”. If you simply ignore your pup’s begging, they will most likely realize it isn’t working anymore and quit the behavior. Do bear in mind that this might take a little while, but be patient and you’ll both soon be able to eat in peace.